Have you ever wondered what a real paranormal romance would be like? Imagine powerful psychic connections, super sexual chemistry, de ja vus, omens and magical synchronicities. You feel mystically connected on a deeper soul level, and yet there seems to be a dangerousness about it. The passion may be unstoppable if you cross that line. Longing and passion builds as telltale signs appear that he or she must be “the one”. A love drama unfolds with emotional highs, crashing lows and perhaps even paranormal activity. You find yourself doing things that you have never done with other partners. You take greater risks that may be out of character for you. The love affair becomes erratic, obsessive or unable to consummate . It is as if the lovers are being buffeted around by unseen forces from one exhausting drama to the next. It feels surreal, orchestrated as if it is influenced from the beyond. 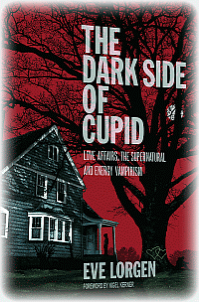 If you’ve ever thought you have met your soul mate but were baffled by magical omens, paranormal activity and exhausting emotional drama, you may first want to do a background check on Cupid’s evil twin. Through several case histories, identifiable signs and symptoms and a questionaire, the author introduces the reader to a new understanding of mystically connected love relationships gone wrong. She offers practical tools for recognizing, dealing with and healing from these traumatic, fools-gold soul mate connections.